The best Rick Parfitt and Status Quo tale (or tail) I have heard is about the time Status Quo were touring Australia in the mid eighties, and their tour bus hit a kangaroo. They stopped the bus to check on the hapless creature, only to find it had hopped it’s last hop. It isn’t recorded whose idea it was to dress the poor creature in sunglasses, denim jacket and bandana and then take a picture of the band with it, but we can be certain it wasn’t the kangaroo. However, what is certain is that when the picture was taken, the flash startled the (as it turned out) only concussed kangaroo, which then boxed the gurning Quo out of the way and bounded off into the outback dressed like Axl Rose. Which was all very amusing until they realised the keys to the bus were in the pocket of the jacket. I re-tell this story because with 2016 having done its level best to beat us all into submission with music-related deaths and general bad vibes, I feel the need to be positive. To remember the funnies. The reasons why music and bands move us all and to celebrate the good times. So there’s one about Rick Parfitt, and I hope it cheered you up. It’s worth pointing out that the family entertainers now known as Status Quo were seen by much of the public in the early to mid eighties as a “heavy metal band”, to be categorised in the same bucket as AC/DC, Motörhead, and the other bands that “headbangers” listened to and whose names were written in jagged letters upon patches sewn on to the back of denim or leather jackets. My inauguration happened in 1982 when the live version of “Caroline” was released as a single. I had thus far been raised on a musical diet of The Wombles, hymns, Terry Wogan and whatever was on Swap Shop, so this sounded electric. A roaring crowd, filled with anticipation, an underlying synth sound and then the fizz of a guitar lick or two before the buzzsaw opening riff came in. The accompanying live album allowed the crowd noise to linger for over a minute before the song kicked in. It might sound pretty perfunctory now, but back when Adam and the Ants and Shakin’ Stevens were dominating proceedings, this was edgy stuff. The second LP I ever bought was Quo’s “Back to Back”, the album that contained “Ol’ Rag Blues”, “A Mess of Blues” and the much maligned “Marguerita Time”. I then found a double cassette of the compilation album 12 Gold Bars and 12 Gold Bars II, which has all you need to know about Status Quo therein. Trips to Woolworths, Parrot Records and Our Price ensued. I bought most of their early ’70s output as funds allowed. I loved the On The Level cover, as they had such laughable flared trousers (when drainpipes, the mod revival and ska were the thing), and a lamentable leather waistcoat and boots combo. John Coghlan looked mortified to be photographed wearing that get-up especially on the reverse of the sleeve, whilst Rick Parfitt remained effortlessly cool sporting a scarf that would have looked ridiculous on me, had I decided to emulate his look. Which I didn’t. Promise. I saw them in concert supporting Queen at Wembley Stadium and afterwards headlining Reading Festival, supported by Bad News amongst others. I was, I suppose, a member of the “Quo Army”. All of which self-indulgence allows me to claim sufficient credentials to present to you an Alternative Best of Status Quo – songs that were either a) not hit singles (mostly) and b) not on either volume of Twelve Gold Bars (mostly). Claudie has the sort of suspended chords and gentle melodies and harmonies you might find on a Byrds album, contrasting with the rockingest “Blue Eyed Lady“. “Backwater“, one of three here from the “Quo” LP is an old live favourite. A multi part introduction belies the “search for the third chord” joke, which is then followed by a covetable chunky riff. The whole thing flows with a wonderful clattering of drums into “Just Take Me“, a Bo Diddley riff made into one of Quo’s best songs, and one of the two singles in this playlist, but inexplicably left off the Twelve Gold Bars compilation. The guitar geeks amongst us can also enjoy the contrasting low register of Parfitt (or Rossi) played against the (capo’d?) higher register of Rossi (or Parfitt) – which is a great way for two guitarists to complement each other without playing the same thing. “Lonely Man” is basically the best Stone Roses song they never wrote, with arpeggios, song structure and guitar licks that would have improved “Second Coming”. I’m not kidding. I can hear Ian Brown, John Squire et al covering this all day long. From “On The Level” comes “I Saw The Light“. This is traditional Quo, the kind of song they were knee deep in early in their career and which would be a single anywhere else. “Over and Done” also from “On The Level” has a wonderful jangly guitar tone, a tight groove and is as catchy as heck. Back to a Bo Diddley sound with “That’s A Fact” from “Blue For You”, an album cover that features not just double denim, or even triple denim, but quadrupole denim in a couple of cases: shirt, waistcoat, jacket and jeans. “Is There A Better Way” begins as one of Quo’s heaviest moments. The kind of song to stick your thumbs in the loops of your jeans to, allowing you to jig like a flamingo opposite a like minded loved one, if you can track down such a specimen. It then throws a curve ball by going a bit Abbey Road era Beatles before reverting to type. 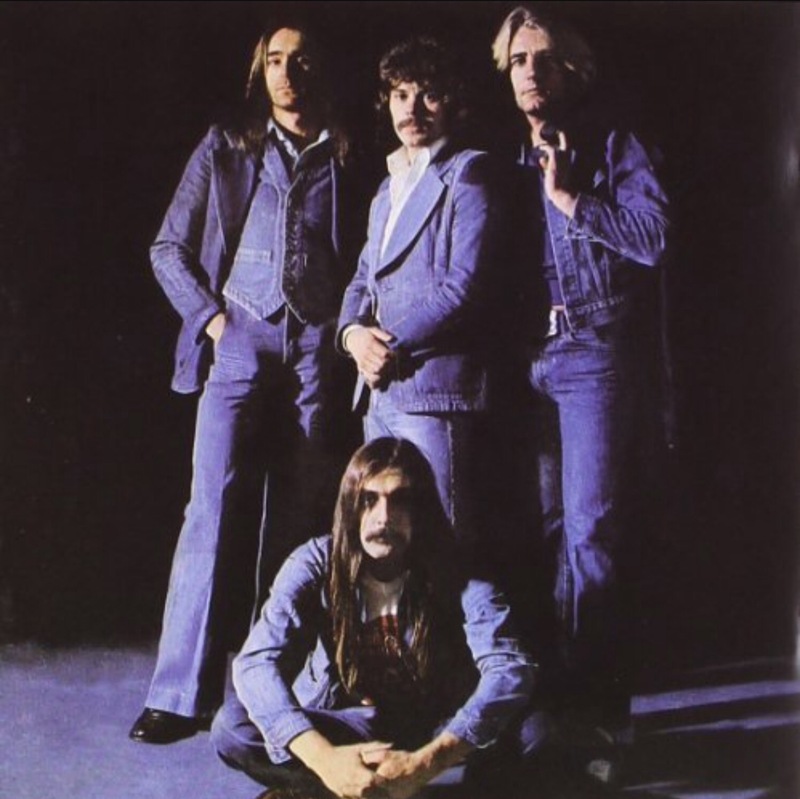 “Rock and Roll” is the other single on this playlist and is Quo’s best ballad (other contenders include “Dirty Water” and “Living On An Island”). Later albums provide slimmer pickings but from “Never Too Late” (the last to feature the classic line up of Coghlan, Lancaster, Parfitt and Rossi) “Carol” is a high energy take on the old Chuck Berry song, also covered by The Rolling Stones, whilst the last track on the album “Riverside” is a great swan song, a belting rocker. The last track “Doesn’t Matter” is from the “1982” album and would have made a decent single. I knew I would leave someone out on my compilation. Very stupid of me for leaving out Rick Parfitt. Thanks for reminding me. Now it’s a question of which songs to use, any ideas? Well, there’s anything from 12 Gold Bars, or from the playlist above. That is indeed a great story about the Kangaroo …haha….Nice call telling a lighthearted story with everything around being so glum…..
Steve, that story is pure gold. Living in Oz you do hear some interesting kangaroo stories but that one nails it. I can then just imagine a truckie doing a long haul and then spotting the roo wearing the gear…’man, i gotta give up those pills’. It’s a good one isn’t it? And yes, the sight of said ‘roo to later onlookers would have begged a few questions. I like to think the kangaroo itself later turned to drugs and fell in with a bad crowd. Sadly I suspect the story itself is apocryphal, but worth repeating nevertheless. Quo were the first band I ever saw live in the late 70s. They were everything I thought they would be and more. RIP Rick.